Info "Get 'em before they go bad!" Farm Fresh is one of The Job Center microgames in WarioWare: D.I.Y. The player has to draw a vegetable. 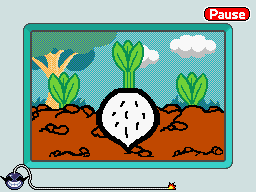 The player has to tap the grass which appears on the ground to pick the veggies before they are rotten to win. If the veggies are rotten, then the player loses the game. Also, if one veggie is missed, the player also loses. "You gotta yank veggies out of the ground really fast in this game! But we need another veggie design, so get on it!" This page was last edited on October 1, 2018, at 14:51.